The Law Offices of Stefan R. Latorre, P.A., is a premier law firm of experienced and successful lawyers and legal professionals representing clients throughout North and South Carolina and Florida. The firm concentrates in the areas of personal injury, workers’ compensation, immigration, and criminal defense. The firm has offices throughout the Carolinas and Florida. Our talented attorneys have successfully represented over 25,000 individuals throughout the Carolinas and Florida. We are proud of the excellent reputation we have built by delivering high-quality, honest, legal services to our clients. The Law Offices of Stefan R. Latorre was founded in 1996 by Stefan Latorre to provide real solutions and justice for clients. For the past twenty years, Mr. Latorre and our team of talented attorneys and legal professionals have been dedicated to providing the best legal representation and personal attention and commitment to our clients. 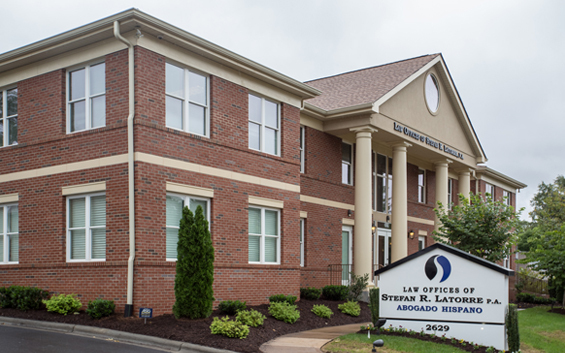 At The Law Offices of Stefan R. Latorre, our clients come first. We are committed to protecting and vindicating the rights of our clients. We do not believe that a person’s wealth, education, or legal status should have anything to do with their right to justice. With our years of experience and knowledge of the legal system, we zealously represent and strive to obtain the best possible outcome for our clients. We offer free initial consultations with a contingency-basis fee structure for all injury cases. This means you will have no legal fees to pay unless we recover a compensation for you. We believe in helping injured people, and we work thoroughly and consistently to do what it takes to help you get a fair and just result. Your accident deserves a thorough investigation. Even if you are not sure you have a claim, we can provide you with a thorough analysis at no cost. We fight to obtain the best compensation for our clients, and we keep our clients well informed during the entire claim process and especially if litigation is needed. We have also helped thousands of immigrants obtain their lawful permanent resident status and naturalization in the United States. We have successfully represented hundreds of clients in deportation or removal proceedings and obtained the lawful permanent residence of many who were on the verge of being deported from the United States. Our experienced attorneys have also represented thousands of clients in criminal courts for all kings of criminal charges. Although it is not possible to obtain a dismissal in every case, our experienced attorneys often obtain the quick release from jail and negotiate with prosecutors and arrange for reduced charges or sentencing. We are committed to defending our clients’ rights regardless of their economic situation or legal status. If you are looking for an attorney who understands your needs, let us make you our priority. We are committed to developing strong relationships with our clients that they can count on. For a free consultation with one of our highly trained legal professionals, please call us toll free at 1.800.966.6769.